Here is a lighting solution for the day-to-day driver. The Lazer Star LX LED upgrade headlights are a plug-and-play kit designed to replace your UTV’s stock, inefficient halogen bulbs with a much brighter LED capsule that draws less power. The H13 Bulb Base LED upgrade offers high-low options with a 40-watt high and 20-watt low beam. They put out 4000 and 2000 lumens of 5500 Kelvin, cool white light and feature a 20,000-hour lifespan, which means they should last longer than just about any UTV out there. With LED lighting, the electrical draw is also greatly reduced with a 3.4/1.9-amp draw at 13.8 volts. The kit also carries a three-year manufacturer’s warranty. The kit comes complete with two high-quality H13 Cree LED capsules with 20-watt low beam and 40-watt high beam LED chips. The kit also comes with the inverters wired inline and adapter plugs for direct install on the UTV. You will be using your stock housing, so the OEM reflector and lens quality will be the only things separating these from a full-blown performance race light. Currently, these kits are also available for lights with 9005, 9006, H4, H9, H11 and H13 bulbs. This covers a whole lot of vehicles, but we imagine they will be adding more options as they see requests coming in. Installation is as simple as it gets. 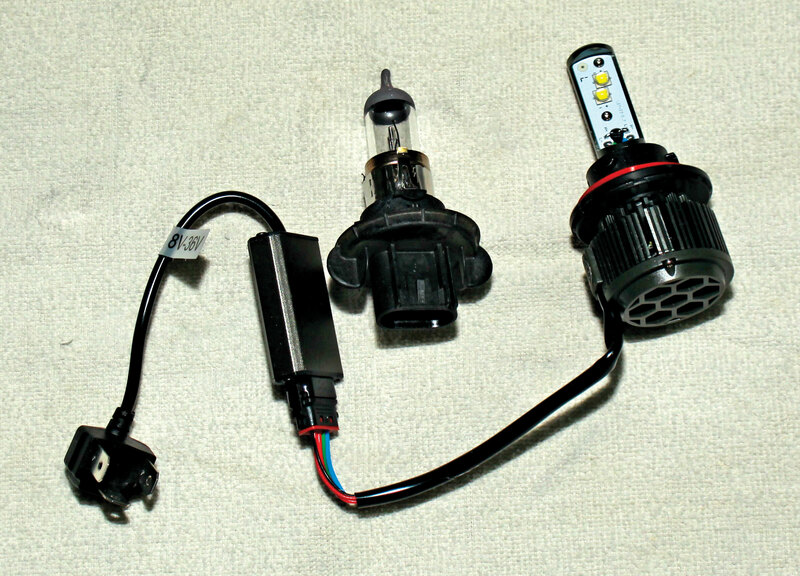 With the key/ignition off, unplug the stock plug, remove the rubber protective cover and remove the stock halogen bulb. Install the LED capsules in the reverse manner. You will want to ensure that the LED chips on the capsule are facing left and right, not up and down for an optimal light pattern. You will reinstall the rubber cover and then install the adapter plug inline from the LED capsule to the stock wiring harness. You can use a zip-tie to secure the inverter against a frame rail to keep it from bouncing around. Turn the key on and check out your new performance lighting! The lighting performance is night-and-day better than the stock halogen bulbs in our RZR. The Lazer Star LED setup not only puts out more light, but it also produces a more usable spectrum of light that further helps with visibility and gets rid of the hot spots associated with halogen or HID lighting. The LED setup is a lot closer or equivalent to the LED light output on a RZR XP 1000. This is pretty darn impressive, as the XP 1000 lights are really good. We have pre-ran a good half of the Baja 1000 course at night with a stock XP 1000 and were fine without any additional lighting. You would not even consider this with the stock halogen setup on the 570 or the 900. One other very cool thing about this kit is that you can retain the high- and low-beam functions. This is not a huge deal in California, but it is super important in any place that you can drive your UTV on the street. In California, we still find the high-/low-beam function useful for common courtesy on crowded trails or ride spots. This high-low feature will also be a no-brainer for anyone wishing to install these in a jeep, pick-up truck or automobile that will see on- and off-road use. These kits are a great upgrade for any UTV with stock halogen headlights. We would prefer running this upgrade over stock on any of our vehicles that don’t come equipped with LED headlights. For $150 you can’t beat the immediate improvement that you will get. If you drive your machine occasionally at night, you will be very impressed with the performance, and it will be right there at a flick of the stock headlight switch. If you’re a super-serious sand duner that spends lots of time driving at night, you might consider a small light bar and this stock LED upgrade, as your machine will have plenty of available power. If you’re looking to race at night, these are not the lights for you. You just need to buckle down and install a good light bar and/or pods. On a final note, these will be an amazing upgrade on any road vehicle that uses an available bulb type.